In 1965, Command Pilot Gus Grissom and Pilot John Young successfully piloted the Gemini 3 spacecraft on a four-hour and forty-three-minute mission into Earth’s orbit, completed a handful of tests of the craft’s capabilities and returned safely to solid ground. Afterwards, their actions during the mission were the subject of a Congressional House Subcommittee hearing and both Congress and the NASA brass gave Young strongly worded reprimands. What went wrong? It all starts with snacks. Food is essential to voyages of exploration, especially in outer space. Space travel has a significant effect on the human body – bone density decreases, muscles waste, red blood cells are lost, etc. – so good nutrition is incredibly important to keep astronauts healthy and functioning. Today we think of “space food” as Tang, food sticks, dehydrated ice cream and other fun, appealing items, but in the early days of the manned space flight, the culture was driven by the military and the food was approached in a certain utilitarian fashion. In the development of space foods – some of the earliest of which were adapted from items designed for earthbound use in high-altitude, high-speed scenarios by fighter jet pilots – minimal weight and bulk and long-term preservation in extreme conditions were prioritized above flavor, texture and presentation. While astronauts’ enjoyment of the food was supposed to be factored into the creation and selection of food items, their feedback was often brushed aside. The USA and USSR both started off using puréed foods in aluminum tubes for space flights. The food could be eaten through a polystyrene extension tube connected to the astronaut or cosmonauts’ helmets. Both countries used a wide variety of foods in these containers, including John Glenn's first orbital meal: applesauce. Astronauts had their tubes complemented by bite-sized compressed food cubes, created to address scientists’ concerns about free-floating crumbs that couldn’t easily be cleaned up and might damage equipment, clog vents or be inhaled by the astronauts. Flavors included bacon, cheese and crackers, peanut butter and fruitcake, but it appears most astronauts didn’t notice a difference in flavor from one cube to the next. Soviet cosmonauts, meanwhile, rounded out their meals with fresh items like bread, salami, jelly, roast veal, apples, oranges and caviar. Scientists there had the same concerns about crumbs, but instead of putting effort and money into mission-appropriate food, they concentrated on methods and equipment for cleaning the crumbs up. Red Menace 1, America 0. 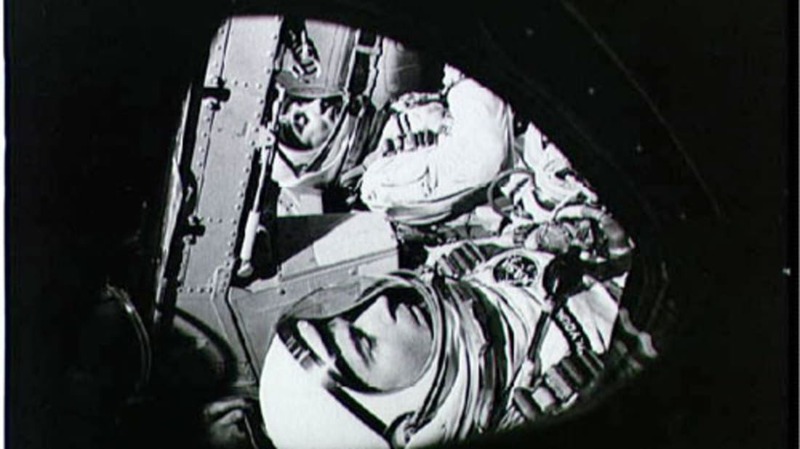 When Gemini 3 was ready to launch, both the space race and the space food situation were pretty unappetizing. If JFK wanted a man on the moon by the end of the decade, NASA had plenty of work to do, and each flight and each mission had to achieve certain goals to move the whole operation toward that end. One of the jobs the Gemini 3 crew was tasked with was testing some food tubes and some new specially packaged fresh items. Scientists wanted to know for future flights how the packaging fared and how well the crew could work and eat at the same time. Grissom and Young were given several food tubes and sealed packs containing fresh hot dogs, brownies, chicken legs and applesauce. Knowing that Grissom often complained of the “dehydrated delicacies concocted by NASA nutritionists,” Walter Schirra, an astronaut who had acquired a reputation as a joker, decided that the Gemini crew would have a little something extra to munch on while in orbit. The day of the launch, he went to Wolfie's Restaurant, a deli not far from the space center, and bought a corned beef on rye sandwich. He brought the sandwich back to the base and slipped it Young, who proceeded to hide it in his pocket smuggle it on board the craft. About an hour and 45 minutes into the flight, Young pulled the sandwich from his pocket and handed it to his surprised Commander, provoking the following exchange. Young: I brought it with me. Let's see how it tastes. Smells, doesn’t it? Grissom: Yes, it's breaking up. I’m going to stick it in my pocket. Grissom: No, you can handle that. In all, the astronauts spent about 30 seconds talking about the sandwich and only ten seconds of that time tasting it before it began to fall apart in the absence of gravity and Grissom tucked it away. The half-minute incident created a good deal of fallout, though. Congress, responsible for NASA's budget grant, wasn’t too amused with the idea that highly trained and supposedly highly disciplined astronauts felt that a practical joke was appropriate and/or funny on an expensive and high-profile space mission. In the end, though, NASA’s then-Administrator James Webb sided with Congress instead of his pilots and Young was officially reprimanded. The incident didn’t do much to damage the astronauts’ careers – Young served in the Apollo Program, landed on the moon during Apollo 16 and later piloted the Shuttle; Schirra flew several more missions; Grissom flew on the first Apollo mission was scheduled to fly on the first Apollo mission, but died during a pre-launch test and was posthumously awarded the Congressional Space Medal of Honor – but it did prompt a flurry of regulations governing what could and could not be consumed in space. After the corned beef boldly went where no sandwich had gone before, NASA only allowed officially sanctioned food on spacecraft and the days of astronauts packing their own lunches were over.